The event will take place in HIB 341 from 12:00 PM to 2:00 PM. Can’t make it for the whole event? 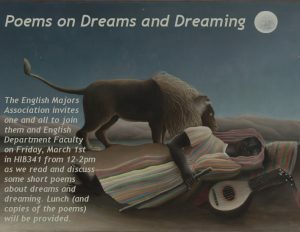 That ‘s okay, still come and enjoy the poetry and relax with fellow classmates and professors outside of the classroom! This entry was posted in Uncategorized by maribev. Bookmark the permalink.